Blyth AFC were made to rue their missed chances as they were held to a 1-1 draw with Hebburn Town at South Newsham. writes Andrew McDonnell. Ross Toward gave the visitors the lead after 11 minutes, and it was Hebburn that went into half-time ahead. The Braves come out fighting from the get-go in the second-half, and created chances freely before Michael Chilton slotted home a penalty on 71 minutes. Time was running out for a winning goal, and several great openings went begging in the final minutes before the referee drew a close to the game. The hosts started the game quickly but that early wave of pressure didn’t pay off as Hebburn went ahead on 11 minutes. An overlapping run from Scott Wallace caught out the back line, his cross was flicked on by Craig Malley before Toward swept the loose ball home. The visitors should have doubled their advantage on 26 minutes, Daniel Robinson beat the offside trap and burst through on goal, but struck wide. 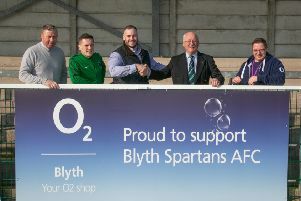 Blyth’s first real opening come on the half-hour mark when Liam Hudson’s cross found Bobby Taylor at the back post, and the wide man’s effort was ushered off the line. David Robinson and Taylor went close once more as the Braves started to find a foothold in the game.In the first minute of additional time, Jake Armitage drove forward and cut inside before his effort was blocked on the line. Gary Day reacted quickly, but he dragged his shot wide of Steven Hubery’s goal. Hudson missed the target twice in the opening five minutes of the second-half before Robinson went close at the other end for Hebburn. Blyth’s Robinson put pressure on the Hebburn defender on the edge of the area two minutes later. The ball broke and the skipper’s effort was cleared off the line, and Paul Antony’s rebound flew inches over the crossbar. Day was denied once more and there was a sense of frustration around South Newsham, however, Blyth were awarded a penalty after Marc Lancaster was tripped up in the area. Chilton, who scored a brace against Esh Winning on Wednesday, slotted home to level the game with 19 minutes to play. Taylor floated a free-kick into the box on 79 minutes, and Chilton’s brilliant header was matched by an even better save - Hubery tipping the ball over the bar.